* No financial risk from losing or damaging ring. 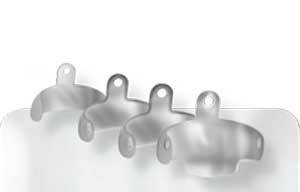 * Stackable and can be placed without removing ring for improved seal of the box with ease. * Saves time and money due to less finishing. 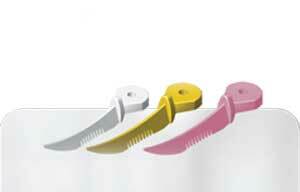 * Forceps designed with built-in grooves to simplify setting rings and minimize hand fatigue. 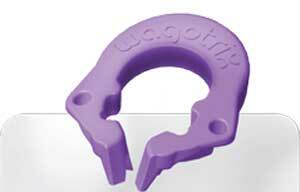 Wagotrix™ rings ofer ideal contact point pressure for single use only. 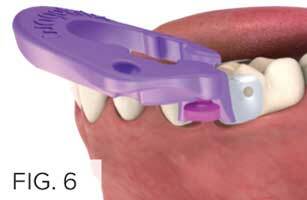 Multiple use may result in insufficient pressure resulting in less desired clinical results. 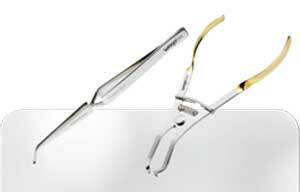 Matrix Forceps and Pin-Holders should be steam autoclaved at 273ºF/134ºC. Chemical sterilization is not recommended. 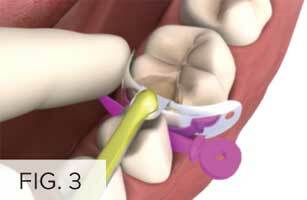 Ring placement: For added security, prior to placement, feed dental floss through the holes in the Wagotrix™ ring. 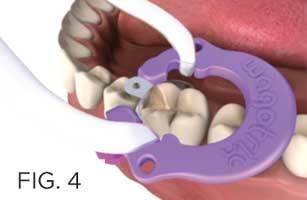 Improve efficiency by allowing dental assistant to pre-load Wagotrix™ ring onto the ring placement forceps. 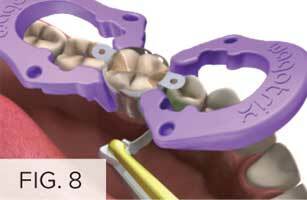 Wedge & matrix placement: Both wedges & matrices can be accurately placed & pre-loaded using the Pin-Holders. 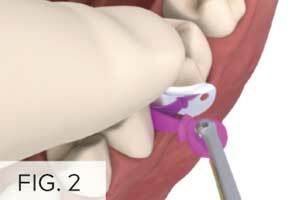 When using the Pin-Holders, squeeze them at the back to open them and near the tip to increase the pressure on the tips. 2. 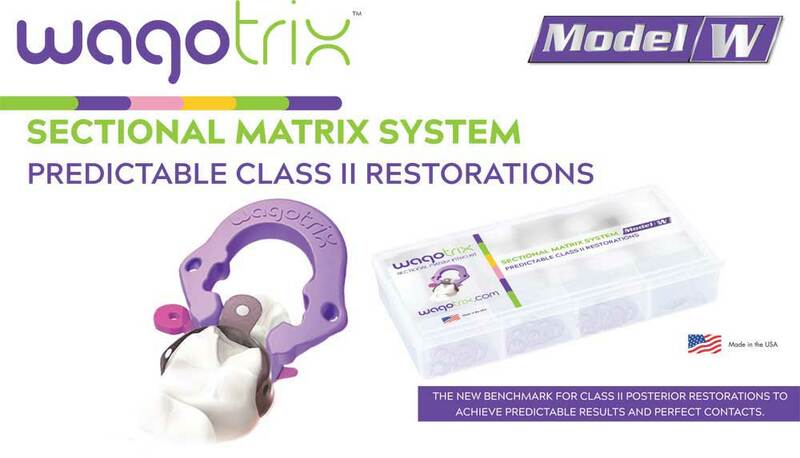 Placement of Matrix. 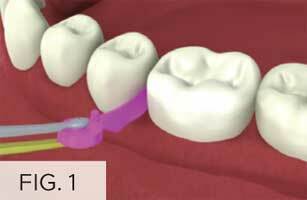 Select matrix based on the approximate occlusogingival height. 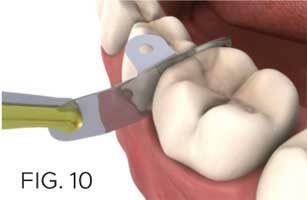 Place prongs of Pin-Holder through corresponding holes in the matrix with the gold side visible to easily disengage the instrument once the matrix is in place. 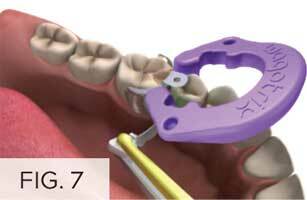 Slightly withdraw pre-wedge before inserting matrix and then reinsert wedge once matrix is placed. 4. 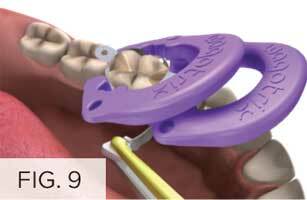 Perform Restoration: Proceed to fll entire cavity preparation with Wagofl™ Zirconium Composite, or desired composite material. If needed, you may use another Pin-Holder on the “opposite” side of the matrix and move the matrix back and forth, or upward, until loose. 6. Contour & Polish Final Restoration.